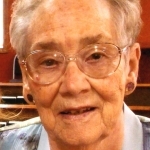 Shirley Ann Borger, age 92, of Saegertown, passed away Thursday, January 17, 2019 at Meadville Medical Center. Born in Cussewago Township, she was a daughter of the late Guy and Carrie McKissick Barnes. Shirley graduated from Edinboro High School in 1944 and was married later that year to Lewis Borger. They lived in Lake City for 25 years until building their home in Cussewago Township where she lived out her remaining years. This last year she resided at Wesbury United Methodist Community. Over the years, Shirley had been a 4H leader, a Bible school teacher, and she enjoyed hunting and fishing, and sewing and knitting. She attended the Senior Center in Cambridge Springs where she could often be found playing cards with her friends. She was a member of the Independent Order of Oddfellows Lodge in Edinboro. Her husband, Lewis, preceded her in death, as well as an infant daughter, Ruth Evelyn Borger, and a brother, Gaylord Barnes. Family members include her three children- Joann Borger of Cambridge Springs, Larry Borger and wife Betty Jo of Huntsville, TX, and Debra White and husband Steve of Saegertown; six grandchildren- Carrie (Gordon) Pietrowski, Sherry (Dan) Wygant, Jamie Borger, Weston (Kayla) Borger, Shelby (Tatom) Thomas, and Marcie White; five great-grandchildren- Keith (Sandra) Pietrowski, Blaze (Kelly) Pietrowski, Jacob Wygant, Luke Wygant, and Kessley Borger; two great-great-grandchildren- Kylie and Aiden Pietrowski; and Shirley’s sister Bernice Graff of Fairview. Friends may call at Van Matre Funeral Home in Edinboro on Thursday from 2-4 and 7-9 p.m. and are invited to funeral services there Friday at 11:00 a.m. Officiating will be Rev. Ron Sheldon of Cornerstone Baptist Church. Burial will be in Carmel Freeman Cemetery. In lieu of flowers, memorials may be made to the Cambridge Springs Senior Center. It was always a pleasure to visit Aunt Shirley and Uncle Lewis when visiting my grandparents Gay & Gerry, as a kid. It is sad to hear of her death. Our hearts go out to Joann, Larry, and Debbie, and their families. Hopefully smiles from the memories will soon replace the sadness now felt.